Here’s wishing all visitors ‘A Very Happy Valentine’s Day’. 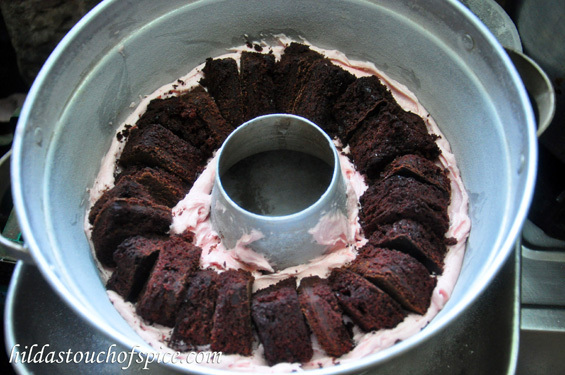 For the heart cut outs I used my Chocolate & FreshStrawberry Cake recipe. 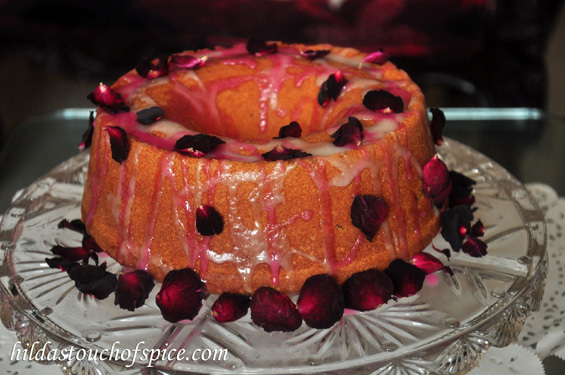 For the covering cake mix I used my Vanilla Sponge Cakerecipe. 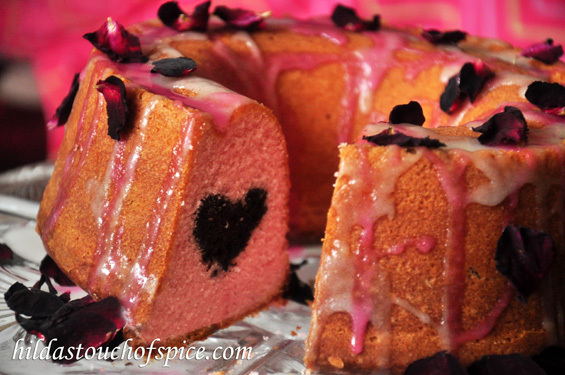 Add red food color to tint the cake batter to a pink shade and strawberry essence to flavor it. Bake the chocolate cake batter in a square or rectangular pan. 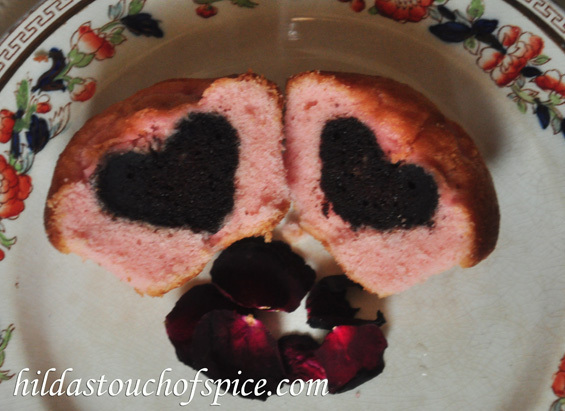 Cool the cake completely and then use a sufficiently small heart shape cookie cutter to get heart cut outs. Eat the extra scraps or use it for other desserts which include cake. I baked the cake in a Bundt baking pan/tin but if you do not have one you may use a loaf tin or any baking tray you are comfortable with. Just remember you need to have sufficient depth to lay and hold the cut outs within the baking tin. Also it is very important to remember the arrangement and pattern of layering so that when you cut the cake the heart pattern should reveal in the right direction. Grease the bundt cake tin with enough butter and dust with all purpose flour/maida. 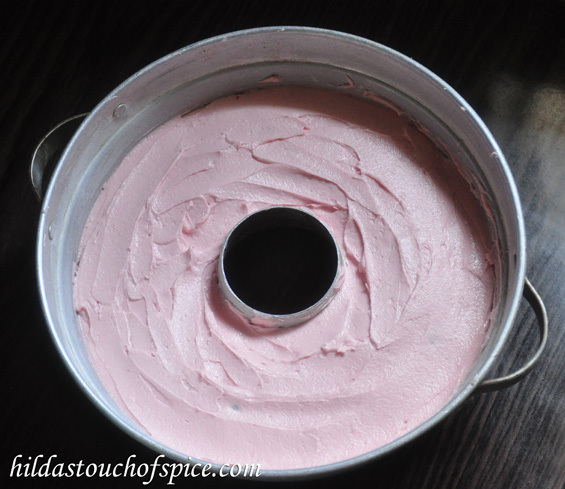 Place half the pink cake batter in the tin and spread evenly. Arrange the chocolate cake mini hearts upside down in the batter; as close to each other as possible and make sure they do not touch the edges of the pan at all!! Cover them with the rest of the pink cake batter as well as the edges of the pan. Level the top evenly and then tap the pan several times on the counter to release air bubbles if any. Bake in a pre-heated oven at 180C.for 45 mins. or until a skewer inserted through comes out clean. (Remember oven temperature & timings may vary). Cool the cake completely and then invert on a serving plate. I baked some cupcakes… you can do this too!